Many new painters will often make the same mistakes over and over again when they are starting out, often not knowing that they are even making them. While mistakes are definitely okay and should be expected when starting out; correcting those mistakes can become the first major milestones in one’s art career. While occasionally a mistake can transform a finished work into a masterpiece by a rare stroke of luck, for beginners, mistakes are simply roadblocks that transform into stepping stones for artists in order to become better. Many new painters will make some of the same mistakes over and over, which is why we chose these as some of the most common mistakes needing to be corrected. 1. Mixing paint on your canvas. 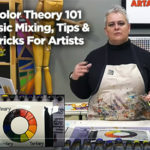 Mixing paint is to be done exclusively on your palette. Do not experiment with color on your canvas, it leads to messier brush strokes and often just junky paint mixing that will be hard to cover up as you paint. If your palette is not big enough to mix on, find a strong piece of paper to mix on that is not your canvas. 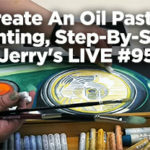 Be direct when putting your brush to canvas and mix your colors on your palette. 2. Do not poke your canvas with your brush. Pointillism is an art form that was developed by Georges Seurat and Paul Signac. It takes an artist poking the canvas with small dots of pure color over and over again to create an image. Many artists just starting out will try and add an element of pointillism to their paintings with dots of color just messily poked on to their canvas. This can be avoided with short strokes and dabs. 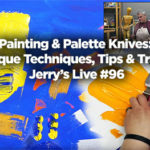 Poking your brush too hard to the canvas will split your brush and push your colors out in odd and messy bursts rather than drop small amounts of color. 3. Using too much white. While mixing with white is fine to create lighter colors, adding too much white directly by itself can blanket out a canvas and make your paintings look chalky, dry and cold. Winter scenes are the exception to this. 4. Being stingy with paint. Do not be afraid to use lots of paint on your canvas. Many new artists are scared to use too much paint at several points during the painting process, both on the palette and on the canvas. You can always buy more paint so do not be afraid to use too much. Better too much than to leave thin areas on your canvas and have the paint dry out too quickly. 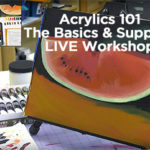 In regards to your brush, use lots of paint and big strokes on your painting. Having too little paint on your brush can make your paint look dry and scratchy when it hits your canvas. 5. Using cheap hobby paint. Do yourself a favor and buy some better paint than from a cheap hobby store. It will perform poorly on its own without any mistakes on your part. 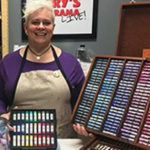 Jerry’s Artarama proudly carries many great paints at an easily affordable price that paint better and offer many more colors than hobby paints made with fewer pigments and more filler. Instead try a paints like LUKAS, SoHo Urban Artist, Charvin and Matisse. They all have higher pigment counts and better lightfast ratings and will paint smoother. 6. (Unofficially) Do not be afraid to make any mistakes. You will make them, so don’t stress about them. Making mistakes is part of the learning process. Just be sure to correct them as they happen and the mistakes you make and learn from will make you a better artist. Have any tips for other common mistakes new painters often make? Let us know in the comments below!